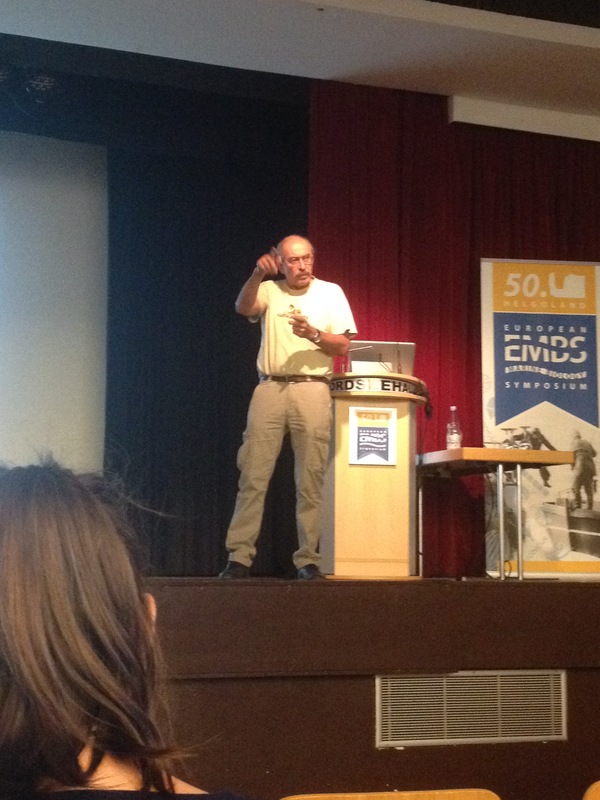 The 50th European Marine Biology Symposium – back where it started. The first marine biological symposium was held on Helgoland in 1965. Since then, it has been held in more than 20 different countries around Europé, som hosing it two or even three times. The main topic this year focuses on long term trends, divided into subgroups of, for example, climate change, microplastics and anthopogenic influence. 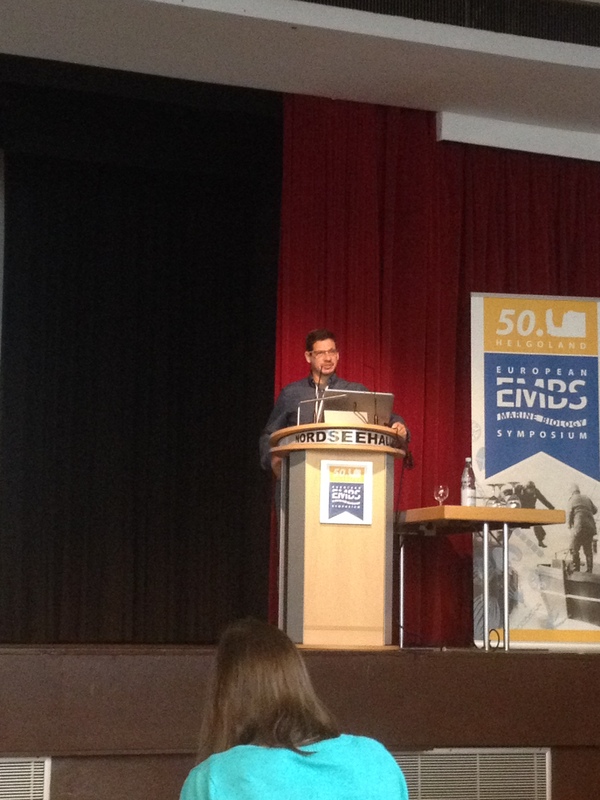 The 50th EMBS was opened by professor Karin Lochte from Alfred Wegener Institute (AWI), long time associated with both Helgoland and the EMBS, opened the conference by summarizing the history of this conference. She pointed out the importance of long term studies, and the need for good methods that do not change over years, to have sites all over the world in order to compare, the need for technology to get high resolution data, and finally to consider how we use data and interpret it. She was followed by professor Karen Wiltshire, the vice president of the AWI, who put Helgoland as a palce of science in a historical perspective. Reknown scientists such as Heisenberg, Alexander von Humboldt, Ehrenberg and Johannes Müller all spent time on this interesting rock far out in the North Sea, commenting on the interesting marine life. The first ”Königlich Biologischen Anstalt” was founded here in 1865, and there is the first photo of plankton nets together with, amongst others E. Heckel, who illustrated with much imagination, life in the seas. Another local comment was ” I met an very nice italian scientist on that there conferenc you had some 20 years ago. It would be nice if you had one of them again”. The motif might not be one of science, but we felt very welcome all the same. The mayor of Helgoland, mr Jörg Singer, welcomed us in a loving and amusing way to the island, saying that this island has probably the worlds highest PhD-density, but confessed that although the locals have no idea of what the PhD’s are doing, they are very important to the island community. The island has formerly been Danish and then British (who traded it with Germany for Zanzibar), and of course have been home to many smugglers. Today, the island is full of tax free shops selling alcohol, cigars and expensive watches, making smuggling a non-profit carreer. 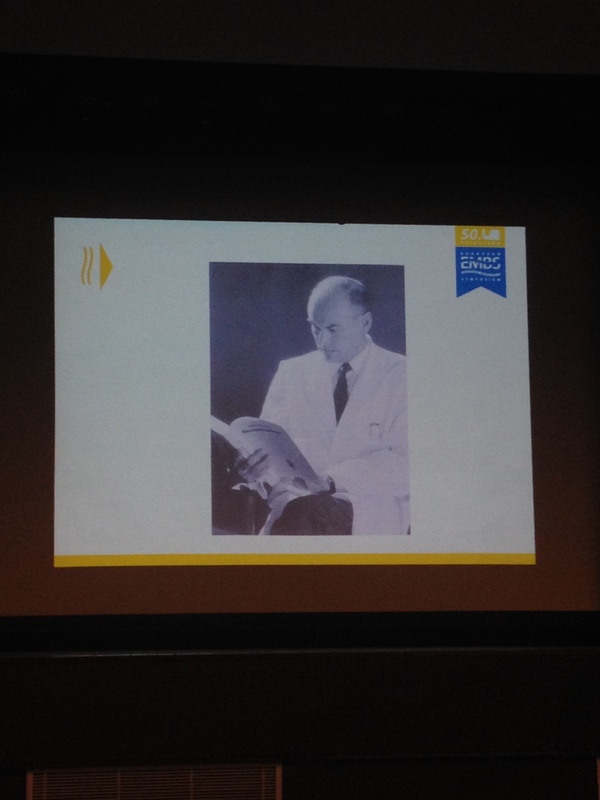 The charming and inspiring renown scientist Victor Smetacek held a commemorative talk over the late Otto Kinne, born in 1923 who passed away in March. Otto Kinne got his PhD in Kiel, supervised by professor Adolf Remane, the founding father of comparative zoology, who hugely influenced zoology in Germany. Otto not only published his thesis in 1953, he also published no less than 15 papers, only 2 of which he was not single author. Victor rightly describes Otto as an übermench. Otto also instigated the Helgoland Symposium series, which were hugely popular, not least due to the cheap drink available on the island. This was the beginning of what then evolved into the EMBS. Otto Kinne also started one of my favourite scientific journals, Marine Ecology Progress Series (MEPS), which was edited by himself in his home for the first years. Today, everyone would like to publish in this journal, which is one of the most prominent in marine ecologyeveryone would like to publish in this journal, which is one of the most prominent in marine ecology. The first session was on the theme ”Drivers of ecosystem change in marine/coastal ecosystems”. Julia Meyer showed a very nice long time series starting in 1972, same year as the timeseries we will present tomorrow started. Her series was data on species composition shifts in epibenthic and demersal fish species in the Jade area. It was interesting to see a dataset similar to ours, allthough this was much more stable since only two persons have been collecting data over the years. Ours is done by students on the marine ecology course. 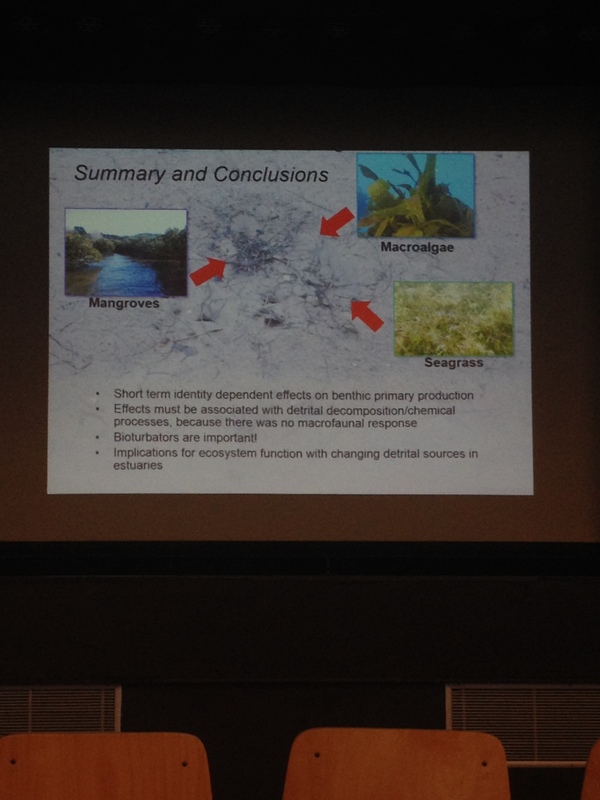 Rebecca Gladstone-Gallagher from New Zeeland presented some very interesting studies on the organic enrichment effect of microbethos by seaweed, seagrass and mangrove leaves in an estuarie. She is two years into her PhD, so no data is published yet. Alf Norkko, the head of Tvärminne fieldstation in Finland, held a presentation where he pointed out that the only way we can hope to solve the big questions is by working together, showing examples from the Baltic Sea that the Tvärminne group are working on, and presenting in different sessions here during the week. I look forward to listening to more of their findings. Gil Rilov from Israel has setup a research facility near Haifa and is documenting the shift on the eastern coast of the Mediterranean from native species living on the tolerance limit of temperature, to now being more or less a vommunity of non-native species coming from the Red Sea via the Suez channel and taking over the rocky shores. There are some very interesting questons in the field of tolerance limits and species shifts regarding function and complexity. The session ended with a presentation by Sarina Jung, on where the biological limit of the Wadden Sea is, from a phytoplankton perspective. After a quick luch, we went down to the shore to inspect the seaweed species richness. Happy happy found lots of Fucus vesiculosus, Fucus serratus, Ulva, Porphyra and Mastocarpus. The tideline of jetsam contained lots and lots of long, thick Laminaria hyperborea stipes and Desmarestia aculeata. Not much fauna, though. But found some Gibbula shells for the collection. 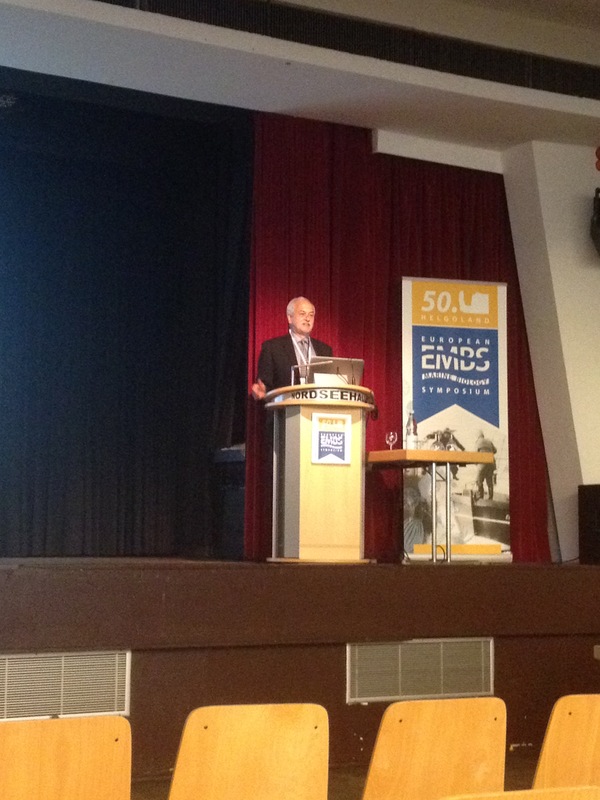 The first keynote speaker was Poul Holm from Trinity College in Dublin. His talk concerned integrated approaches to ocean management. He made some very good points on how we should not see ourselves as narrow specialists, that we should work on the translatory skills to get our results into society and that what drives us all is the curiosity. The need for cross-diciplinary research was highligted, how technical knowledge and natural science need to incorporate the social sciences and the humanities. Sometimes we do not need to restrictourselves to scientific data in order to make people understand the difference between right and wrong. The by now classic pictures of big bass fished in Florida in the 1950’s and the biggest catch of today (nothing bigger than 50 cm) really says it all. Presenting some quite depressing time series that date back to the 19th century, it is remarkable how much data can be found by going into historical archives of log books from fishermen, whalers and other users of the seas. Much of such data is today available on the Internet for those who are interested. Much is summarized in a paper on Marine environmental history, a subject which need more attention I should think. Check out the site http://www.tcd.ie/history/opp/ for more on this topic. We are learning, we are getting more ocean litterate, and we should focus on the solutions, not just highlighting the problems. Continuing on drivers and responses to ecosystem change, Frithjof Moy from Norway gave an exciting talk on the effects of kelp harvesting in Norway, where mainly Laminaria hyperborea is harvested for alginates and the pharma-industry. The Norwegian kelp forrests have declined over the last 50 years, not only due to trawling but also due to grazing by sea urchins. In the middle of Norway, however, it has remained relatively undisturbed. So a couple of study sites have been established here in order to obtain background values. Trawling of kelps naturally affects the kelp biomass directly, but it does not seem to affect either fish or crabs . Two years after trawling the kelp has recovered, although younger and shorter. But here there can be seen a shift in the fish community, where codfish are absent and goldsinny wrasses are abundant. Inka Bartsch then talked of fucoids! Yay! 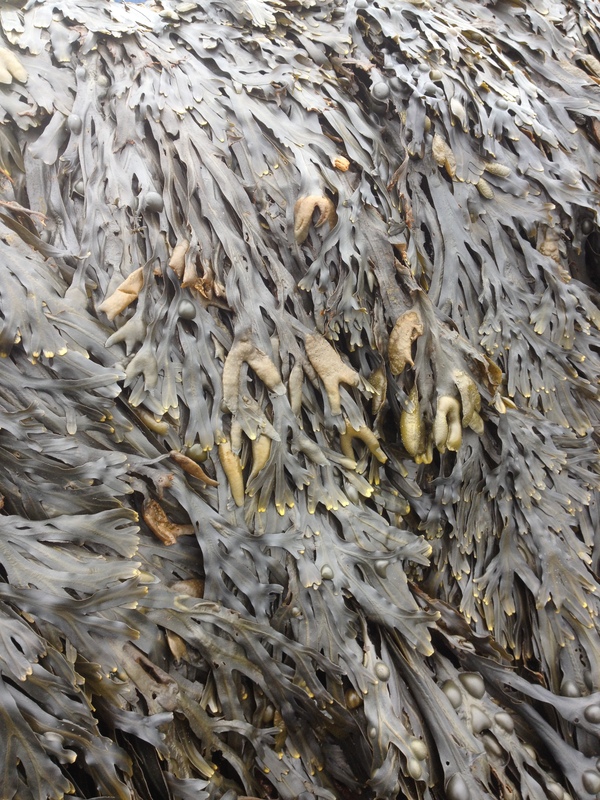 The intertidal flat of Helgoland is mainly composed of a dense Fucus serratus belt. On these flats, 140 sample points are measured twice per year, winter and summer, whereof 60 are on the Fucus serratus community. There was a large disturbance in 2007 with the Kyril storm, and Inka shows that the cover was restored to the before-density in about three years. Also, some very interesting data shows the self-enhancing restoration, where up to 25% och biomass is lost mainly in winter, whick makes way for new growth. The understory community consists of coralline crustose alga, Chondrus crispus, Ulva spp and Littorina obtusata. There was a visible negative effect on the crustose algae efter the storm, showing how sensitive they are to high light levels. There was no immediate effect on the Littorina snails, who graze on Fucus, but the year after there was less snails around, perhaps due to lack of suitable substrate for eggs the year before. The ephemeral green algae Ulva spp. Increased, probably snce there was now much free space and also less Littorina snails around, since they also eat Ulva. Paolo Magni reported on the latest findings concerning the ecological function of the seagrass Nanozostera noltii beds in Venice lagoon. All the way from Canada, Mathieu Cusson (showing some nice Fucus pictures) spoke of multiple effects of disturbance, looking at one of the worlds biggest estuaries, the St Lawrwnce estuary in Quebec, Canada. Here they have Fucus distichus edentatus and Fucus vesiculosus, which forms a cooling, protective layer for many understory flora and fauna, when viewed with a heat camera. 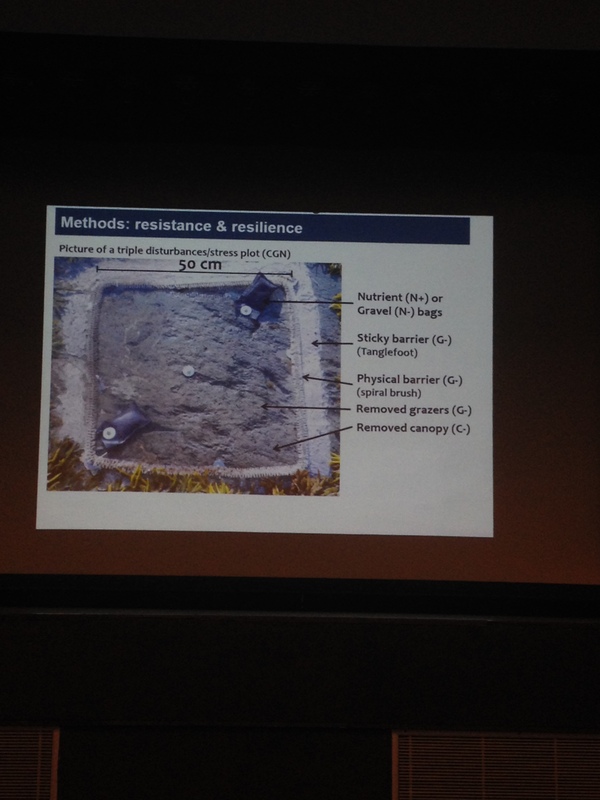 A really neat study of disturbance was performed, looking at resistance and resilience. I am so envious of those working on tidal shores, where it is so much easier to set up experiments. Not that I don’t like diving, but it does take a lot more time. This study shows that species richness is not a good measure for reslilience. Resilience was not affected by enrichment and grazer reduction alone, but interactive disturbance effects could be seen. The always interesting Hartvig Christie appeared and spoke of regime shifts in Norwegian kelp forests to sea urchin grazed barrens. The extent of the loss in Norway is estimated to 200 km2 Saccharina latissima, for example, which naturally effects the associated communities. But the sea urchin communities have now collapsed. It might be due to higher temperatures, or that the urchin-eating crab Cancer pagurus, is moving north along the Norwegian coast. Experiments show that the increasing temperature has a direct negative effect on the sea urchins but also has a positive effect on the crabs, which in their turn negatively affects the urchins further. The loss of Saccharina might also be connected to increasing temperature, since it is a cold water species. It its also sensitive to poor light conditions, and the water quality has been reduced in the last years, which has increased the biomass of epiphytes on kelp, thus reducing light levels below the critical level for kelp survival. These large scale changes in kelp forest distribution are probably the result of complex interactions between multiple factors. Climate change have direct (temp) and indirect effects on the kelp communities. Jennifer Dannheim rounded off the day by talking of the relevance of red list species, asking the question if they are also rare species. They are not. Not all red list species are rare, and all rare species are not red listed. 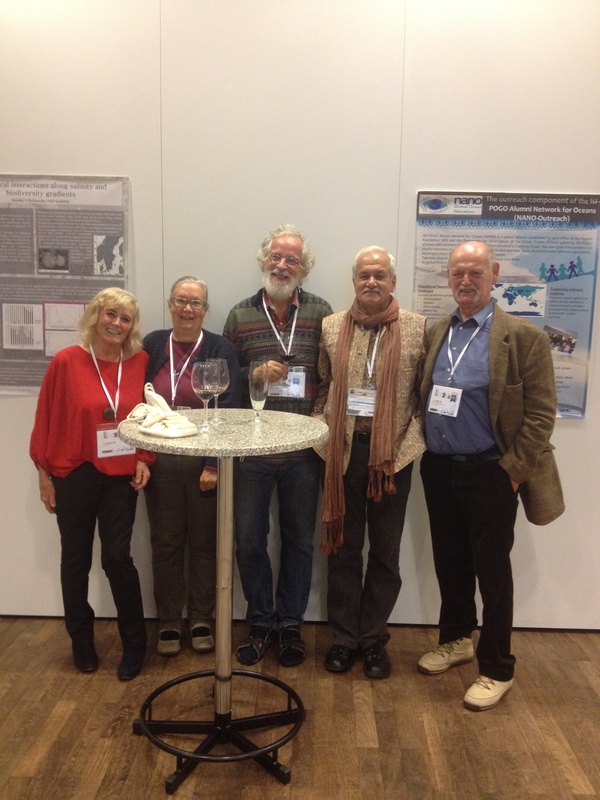 This entry was posted in News and tagged 50 th anniversery, conference, ecology, EMBS, European Marine Biology Symposium, Gil Rilov, Helgoland, marine biology, North Sea, Otto Kinne. Bookmark the permalink.